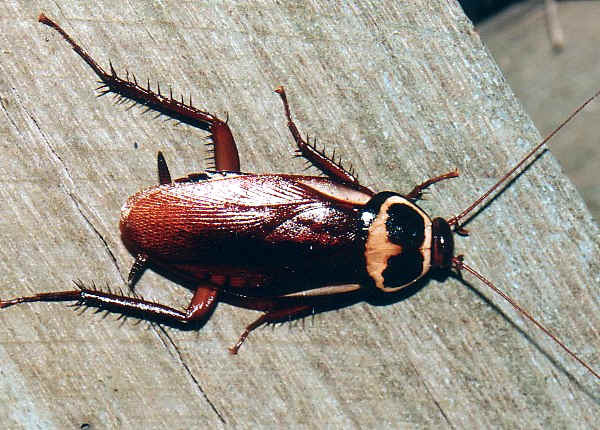 The Australian cockroach (Periplaneta australasiae) is a common species of tropical cockroach, with a length of 23–35 millimetres (0.91–1.38 in). It is brown overall, with the tegmina having a conspicuous lateral pale stripe or margin, and the pronotum (head shield) with a sharply contrasting pale or yellow margin. It is very similar in appearance to the American cockroach and may be easily mistaken for it. It is however, slightly smaller than the American cockroach, has a yellow margin on the thorax and yellow streaks at its sides near the wing base. Despite its name, the Australian cockroach is a cosmopolitan species, and an introduced species in Australia. It is very common in tropical climates, and can be found in many locations throughout the world due to its travels via shipping and commerce between locations. The insect can travel quickly, often darting out of sight when someone enters a room, and can fit into small cracks and under doors despite its fairly large size. It is known to be very mobile; it also has wings which allow it to be quite a capable flier. It prefers warmer climates and is not cold tolerant, however, it may be able to survive indoors in colder climates. It does well in moist conditions but also can tolerate dry conditions as long as water is available. It often lives around the perimeter of buildings. It appears to prefer eating plants more than its relatives do, but can feed on a wide array of organic (including decaying) matter. Like most cockroaches, it is a scavenger. It may come indoors to look for food and even to live, however, in warm weather it may move outdoors and enter buildings looking for food. This species can be found in nature in tropical parts of Australia, it has also been found along the east coast of Australia, all the way from Cape York to the Victorian border.